Roberta Warshaw Art and Design: Ripping out those BAD BEADS!!! 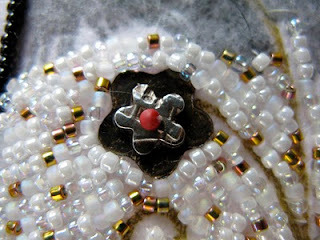 Oh yes, the lessons we learn from our beads... To have the courage to rip and try something else is so admirable! I'm glad your new solution makes you happy and agree that the red flower centers are perfect! By the way, what are the flowers? They're lovely! The flowers are made from PMC. I love making my components out of it! I have the same problem with red. I love the color, especially with blue (which tones it down a bit) but when I use it, I almost always take it out. Too intense? A little goes a long way. I think red stems is a great concept. Maybe try it again another time. Don't you love the doves with red feet? Hmm... I'd like to see a photo of the red stems. They sound beautiful to me. Thanks for the comment on my blog. The fine silver bezel around the doll was actually very easy to form and solder. The bezel wire is very pliable and easy to bend with your fingers. The oval was harder. Lora, I assure you they were really awful. Too matte. Too red. Too much! Congratulations on a nice little gem! Hey Roberta-so glad to reconnect with you. Your beadwork is stunning. And now that I am a follower, I can't wait to see more!